Wires play an important role connecting as well as deciding speed of the connection established.Networking Cables are used to connect one network device to another or to connect two or more computers to share printer, scanner etc. Different types of network cables like Coaxial cable, Optical fiber cable, Twisted Pair cables are used depending on the network's topology, protocol and size. There are several types of wires , few of them will be discussed over here. Twisted Pair--(also known as 10BaseT) is ideal for small, medium, or large networks that need flexibility and the capacity to expand as the number of network users grows. 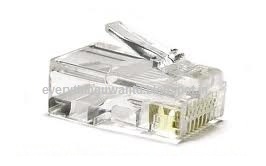 10BaseT cabling looks very similar to that of common telephone cable.If it contains 4 wire then an RJ11(Registered jack) connector should be used and in case of 8 wires RJ45 connector.In a twisted-pair network, computers are arranged in a star pattern as mentioned earlier. Each computer has a twisted-pair cable that runs to a centralized hub. Twisted-pair is generally more reliable than thin coax networks because the hub is capable of correcting data errors and improving the network's overall transmission speed and reliability. Also known as up-linking, hubs can be chained together for even greater expansion. Straight-through cables are used for connecting computers to a hub. An Ethernet crossover cable is a type of Ethernet cable used to connect computing devices together directly where they would normally be connected via a network switch, hub or router.Crossed cables are used for connecting a hub to another hub (the exception to this is when some hubs have the built-in up link port that is crossed internally, which allows you to uplink hubs together using a straight cable). A patch cable is an electrical or optical cable, used to connect one electronic or optical device to another for signal routing. Devices of different types are connected with patch cords, and it works. It is a very fast connection speed. Patch cords are usually produced in many different colors so as to be easily distinguishable.